Introduced as the first sub-100 EUR (~US$125) handset from a major global brand to feature a 2:1 display, the Alcatel 1X is also the first Android Go handset to be unveiled at MWC 2018. Its list of specs includes a MediaTek MT6580 processor, 1 GB RAM, and 16 GB storage. Despite the low-end cameras used (5 MP and 8 MP), the 1X comes with social-ready camera features such as Photo Booth, Instant Collage, and Social Square. Last week, we heard that a very low-priced Alcatel handset would arrive at MWC 2018 as the Alcatel 1X, but there were no details coming with that information. 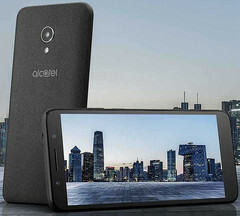 Now, everything is official and we know that the Alcatel 1X is an Android Go smartphone, the first in its price range to feature a 2:1 display. Sadly, there is not much else to say about this handset than the fact that it's the first sub-US$125 device coming from a major global brand to use this screen ratio. According to the official product page, the Alcatel 1X is powered by the quad-core MediaTek MT6580 processor, next to only 1 GB memory and 16 GB internal storage. Fortunately, a microSD slot is also present and provides support for memory cards up to 32 GB in capacity. Obviously, there is no dual camera setup to talk about. The front camera uses a 5 MP sensor, while the main image shooter has an 8 MP sensor. The list of camera features includes Social Square, Instant Collage, and Photo Booth. The first one allows the user to review recent shots in one half of the screen, but keeps the camera active in the other half. Instant Collage provides exactly what its name says, and the Photo Booth feature takes four pictures in a row at a speed of one per second. Powered by a 2,460 mAh and with Android Oreo Go edition onboard, the Alcatel 1X comes in black, blue, gold, and pink. Some future variants will apparently include facial recognition and a fingerprint reader, as well as "a fit and finish that makes it much more premium than its price tag." What we know for sure right now is that the Alcatel 1X is scheduled to hit select markets in April. Single-SIM and dual-SIM variants will be available starting at 99.99 EUR (about US$123).